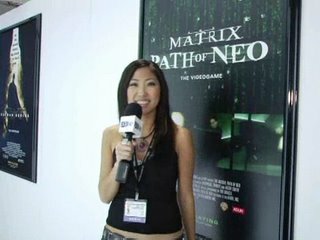 Here you can watch videos of Jelynn's experience at E3 2005 (Electronics Entertainment Expo) which showcases new video games and related technologies. Click on the links to stream the videos (note there may be commercials playing before her segments). Pre-E3: Interviews with people from Activision about what they are bringing. The bad guys don't stand a chance against Private Rodriguez.